This feature is available in the Contact Form Manager Premium plugin only. When you create a Dropdown, Checkbox or Radio Button field, we can use a “key => value” format with comma separation for the option. For example RED=>[email protected], GREEN=>[email protected], BLUE=>[email protected] Here RED, GREEN and BLUE are keys and [email protected], [email protected] and [email protected] are values. In this format we are displaying the values (RED, GREEN and BLUE) in the public side and the keys ([email protected], [email protected] and [email protected]) for the internal use. 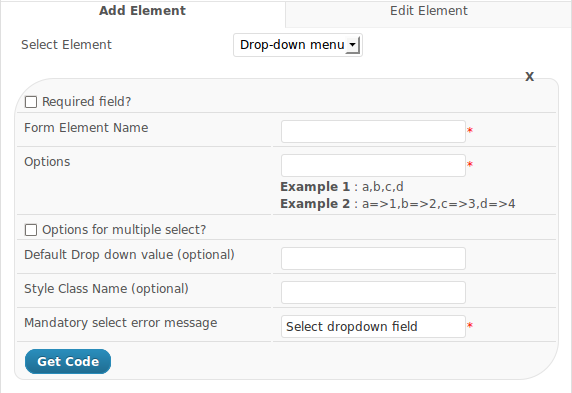 Now save this field and you will get a shortcode for this field like [dropdown-3], [checkbox-5] etc. Use this field shortcode in the “To Email” in the “Mail to Site Admin” page. ← Where can I create a new contact form?